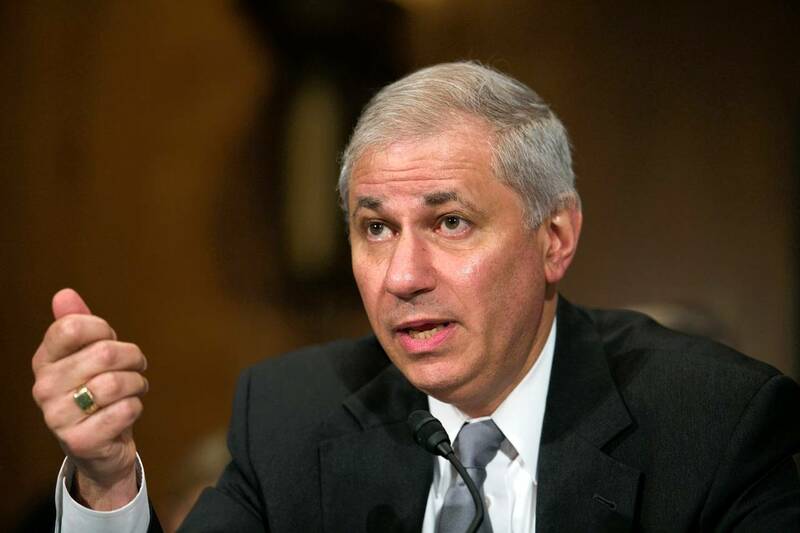 WASHINGTON—Nearly seven years after the financial crisis, Federal Deposit Insurance Corp. Chairman Martin Gruenberg said U.S. regulators can safely guide a major financial firm to failure without taxpayer bailouts or catastrophic consequences for the financial system. Mr. Gruenberg, in a speech on Tuesday, plans to say the disruptive collapse of a firm like Lehman Brothers Holdings Inc. is less likely to happen again given regulators’ ability to force structural changes on banks, new powers to seize and dismantle failing firms and global regulatory coordination. Whether Mr. Gruenberg is correct remains a major debate among lawmakers, policy makers and big banks. The FDIC and Federal Reserve in August told Wall Street banks they aren’t doing enough to ensure they can fail without damaging the economy and threatened to slap them with regulatory penalties if they don’t show significant progress in the next year. Lawmakers like Sen. Elizabeth Warren (D., Mass.) say more needs to be done to push the banks to simplify and reduce risk—including, possibly, their forced breakup. Some Republicans say the postcrisis regime only makes bailouts more likely. Others doubt regulators could handle the failure of multiple major firms at the same time. Standard & Poor’s Ratings Services’ credit ratings of the biggest banks still assume the government would rescue a major financial firm, though the firm acknowledges the likelihood of government support is fading as regulators continue to build out the new resolution regime. “What changes have [the big banks] made that make them more transparent, simpler, smaller, easier to fail? I honestly can’t think of anything,” said Simon Johnson, former chief economist at the International Monetary Fund and a professor at the Massachusetts Institute of Technology’s Sloan School of Management. Without more significant changes, “it’s inconceivable” that a giant financial firm could successfully go through bankruptcy, which is the preferred path under the Dodd-Frank financial- overhaul law, Mr. Johnson said. The big Wall Street banks have sold off assets and business lines and in some cases reduced some of their thousands of legal entities. They contend they are responding in good faith to regulators’ requests but in many cases are waiting for rules to be written, such as with a planned requirement that the parent companies hold a set amount of long-term debt. Eighteen global banks signed a voluntary deal last fall agreeing to wait up to 48 hours before seeking to terminate derivatives contracts if a counterparty bank starts to fail, a change sought by regulators. But the next time a large, global firm runs into trouble, he said it is realistic to believe the firm would be able to go through bankruptcy or a government-run resolution in which shareholders would be wiped out, creditors suffer losses and culpable management would be fired—all without bailouts or damage to the economy. “I think they’re well on their way” to being able to handle a major financial failure, said former Fed Chairman Paul Volcker, who is part of an advisory committee to the FDIC on resolution issues. He said he has been particularly impressed with what the FDIC has achieved internationally. “I’m amazed they’ve been able to do the amount of coordination that they have in fact done. That makes it all the more practical,” he said. Regulators, following a mandate in the 2010 Dodd-Frank law, have moved to develop a strategy for carrying out the new powers they gained to seize and dismantle a big financial firm if bankruptcy would hurt the financial system. Mr. Gruenberg said this ensures regulators won’t face the same impossible choice as in 2008: bail out a firm or let it collapse in a destabilizing way. The FDIC also has worked with foreign regulators—particularly in the U.K. and Europe—on how they would collaborate during the collapse of a global financial firm, he said. Banks are also on notice to make big changes or face consequences such as being forcibly dismantled. Last August, regulators sent letters to 11 of the largest banks telling them they need to do more to make it easier to be dismantled in bankruptcy. The step taken by the Fed and FDIC, which included pointed instructions that the banks must simplify their tangled legal structures and make other operational changes, is evidence of a major development since the 2008 crisis, enabling regulators to force the banks to make “real time changes…to enhance their resolvability,” he said. Mr. Gruenberg said the letters make it clear that if banks don’t show progress, regulators will find the plans not credible, a step that triggers penalties such as stricter capital and leverage rules and, eventually, can lead to a forced breakup if a bank fails to produce a satisfactory plan.